Sphere with dot shading and shadow. 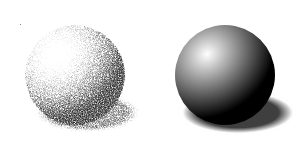 Left: Completed sphere. Right: Sphere with gradient shading and shadow used as input for tile cloning a dot via the Trace tab of the Create Tiled Clones dialog. The Luminosity (L) was picked from the drawing and used to control the Presence and Size of the dots. A random value was included on the Shift tab.